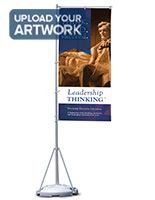 These Flags for Advertising are the Ultimate Promotional Signs for Outdoor Applications! Increase Brand Recognition or Bolster Sales at Your Business with Feather Banners! 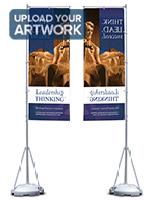 Order Flags for Advertising from Our Massive Online Catalog! These flags for advertising feature the GiantPole flagpoles as well as full color custom graphics of your choice. Each of these flags for advertising comes with a 17ft. 8in. stand that works well for concerts, festivals, tradeshows and other events. 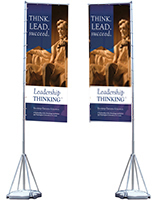 The flags for advertising, also known as feather banners, are designed to hold 43.3"w x 155"h graphics. As such large banner displays, these flags for advertising offer a great way to promote sponsorship, market merchandise or build brand awareness. Although designed to withstand moderate weather, each of the flags for advertising is also ideal for indoor use. 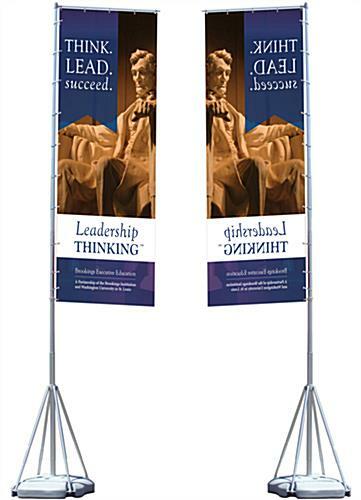 These flags for advertising feature aluminum telescopic flagpoles that collapse for convenient storage. One person can set up the display in a matter of minutes. Your banner is attached to the pole at the ground level, and then each section is elevated and locked in place. 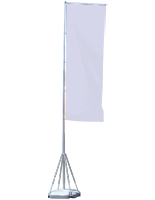 The horizontal flag arm at the top ensures that your signage is always visible. 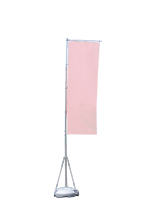 This flag armature also allows your banner to rotate with the wind. At the bottom of the display, a four leg support distributes wind loads while the sand or water filled base provides extra stability. This base also folds for easy travel between events. 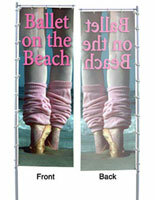 We sell the flags for advertising with full-color custom graphics. Your graphics are printed onto a durable knitted polyester fabric using a large format digital printer. Digital printing is offered for quantities less than 10, as it does not require a minimum order quantity like the silk-screening process. Digitally printed flags are also a better choice for more complex designs, like photographic images or art with gradients. The downside to digitally printing is that is does not offer as high a color penetration as silk-screening. This means that while your images are visible on the back, they are not as vivid as the front side. We also include this flag for advertising with two carrying bags for easy travel. Need Extra or Replacement Flags? We are proud to offer flags for these GiantPole systems. We have researched many different options and have come up with a solution that we feel is the best for a reasonable price. These are real flags that will blow in the wind, not heavy vinyl banners. While they are not the cheapest flags for advertising you may find, with proper care and use they will last for years without fraying and with little or no fading.